Information and Inspiration when you need it most. ESSIAC is an herbal formula that has been in use since 1922. The formula was given to nurse Rene Caisse from a Canadian Ojibwa Indian when she learned a woman who had been taking it was cured of breast cancer. She used it to help people with serious illnesses. Born in Bracebridge, Ontario, Nurse Caisse prepared her original herbal formula into a drink named Essiac, which is Nurse Caisse's name spelled backwards. Despite having no scientific evidence, she claimed it helped her patients. From 1922 to 1978, Nurse Caisse helped thousands of people with her Essiac herbal supplement at her clinic in Bracebridge, Ontario, Canada. Although she refused payments for her services, she accepted donations to help support her clinic. Nurse Caisse dedicated her life to using the Essiac formula to help those suffering from cancer and other illnesses. Burdock cleanses the blood and lymphatic system.It contains Inulin, which strengthens the vital organs such as the liver, pancreas and spleen.It also reduces mucus and prevents formation of gall and kidney stones. Its vitamin A and selenium help eliminate free radicals and its chromium content helps regulate blood sugar levels. Principal component is mucilage which helps the body cleanse itself of toxic waste. It helps nourish and restore plasma in the blood and lymph in the lymphatic system. It improves intestinal flora and soothes asthma. It also helps relieve acids from indigestion and eczema. Sheep Sorrel relieves internal ulcers and applied helps clear skin problems such as eczema and psoriasis. Rich in vitamins, and trace mineral elements, it nourishes the glandular system. Sheep sorrel contains silicon, a necessary element for nerves and the myellin sheath that protects them. Sheep Sorrel cleanses blood and improves liver, intestinal and bowel function. In small amounts, this herb acts as a gentle laxative and purges the body, especially the liver, of toxic buildup and waste. It helps counteract acids due to indigestion. Its malic acid also carries oxygen to all parts of the body, aiding in healing. Rhein present in the root, inhibits disease causing bacteria and candida albicans in the intestines. It helps reduces fever and inflammation. Studies show that rhubarb root has antibiotic and anti-tumor properties. I am a believer in the benefits of Essiac Tea. Not only did it help cure my dog Beanny from osteosarcoma (bone cancer), but it is keeping my father's lymphoma in remission far longer than any of his physician's thought possible. While there are many skeptics, as with any non-conventional treatment that isn't generating large profits for the well-known pharmaceutical companies in this country, Essiac tea appears to have no real side effects or toxicity for most people and dogs (see below for who should not use Essiac tea). Therefore, in my opinion, if you are serious about preventing or curing cancer, it's worth trying. As with any treatment, please consult your veterinarian before using Essiac tea. There are many companies selling essiac formulas. Since only one company owns the rights to the original formula, it is not certain if these other brands contain the exact formula or not. For this reason, I only use the original Essiac. While it may be a little more expensive than some of the other brands, it worked for Beanny and my father and I wouldn't trust my dog's life to anything less. The one thing I have learned with Essiac, is that once you start using it, you must continue to take it, even if the cancer appears to be cured or in remission. My father made the mistake of stopping his Essiac tea after his lymphoma went into remission. A few months later, the cancer was back with a vengeance. Since then, he has been drinking essiac tea daily. It's been over 5 years and he continues to be in excellent health. Also, you must follow the directions for making the tea exactly. It can be time consuming to brew the tea, but once you get into the routine of it, it's a snap. Helping the body to destroy benign growths and tumors. Strengthening muscles, organs, and tissues. Removing toxic accumulation in the body, including heavy metals and other environmental toxins. Aiding in bowel detoxification and elimination. Adding strength and flexibility to bones, joints, and lungs. As a general guide for treating animals, it is best to assess the dosage according to your pet's weight. The best results are seen in animals who had a much larger dose than these recommended doses. However, an issue with large doses for pets is the amount of Rhubarb they end up taking. Rhubarb is a laxative, and that is probably the main reason it is needed in Essiac. In the first 70 years of the 20th century chemotherapy regimens tended to cause constipation, and that is not the case anymore. Dogs have much shorter digestive systems than people, and they are much more susceptible to diarrhea. 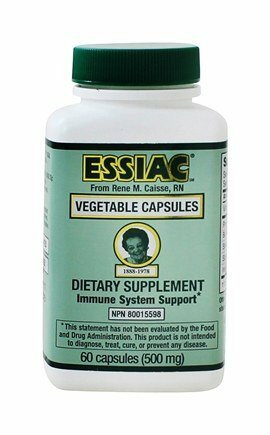 So the larger dose of essiac must be balanced against the amount that can be taken without causing diarrhea. One way to decide what the dose for a pet ought to be is to increase the amount until they get diarrhea and then back off. You can purchase Essiac tea either in powder form (you must brew yourself) or in ready-to-drink liquid form. The powder form is more economical but it does take some time to brew properly. Please follow the instructions exactly for best results. If your dog has kidney disease, are prone to kidney stones, or kidney infections. The varying amounts of oxalic acids in this tea are irritating to the kidneys. If your dog has have a bowel obstruction or diarrhea. Properties in this tea promote peristalsis (the action by which the bowel moves it's contents through). In the case of diarrhea, valuable fluids and electrolytes are lost through the rapid emptying of the intestines. Prolonged diarrhea can result in dehydration and electrolyte imbalance. If your dog has ulcers or colitis. The Essiac has an action of being a laxative or cathartic (depending on how much you take). Some properties in this root can be highly irritating to ulcers and colitis, exacerbating (or worsening) these conditions. If your dog has tumors that are encroaching on a major blood supply or an area of an organ that expansion of the tumor could have dire consequences. In Rene's work, she reportedly noticed that in the beginning phase of a person taking this tea, the tumor could appear to enlarge before it began to break down. (One of the reasons she was adamant that they take very small doses.) If you notice any sudden pain or untoward symptoms after beginning this tea, stop taking it. If your dog has a brain tumor, do not use Essiac tea. In Rene Caisse’s work, she noticed that many times the tea seemed to make the tumor initially grow, then break down. This can be extremely detrimental in the brain tissue. Rapid or excess growth can put pressure on areas of the brain that affect body/mental function. If the tumor would break down, it can release pieces of the malignant tissue which could cause a stroke. Circulation in the brain is unlike the rest of the body. The information contained on this site are intended solely for informational purposes and not for the purpose of rendering medical or veterinary advice. Any information obtained from this site must not be used in the diagnosis or treatment of an animal without the express review by a certified veterinarian. Caninecancer.com assumes no liability or responsibility for any injury or illness that may result from the use of information located on this site. Use of this website is also subject to all applicable laws without limitation or qualification. Copyright 2018. Caninecancer.com. All rights reserved.